Underground Stations is a multi-awarded advertising campaign that sponsors the talent of artist in the subway of New York. 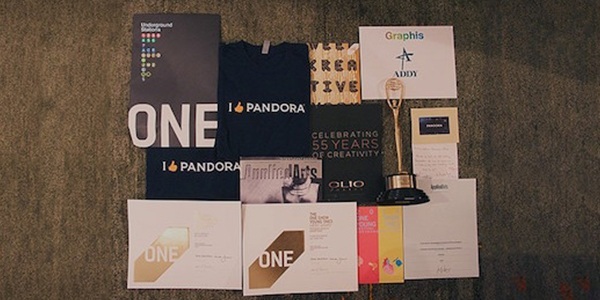 The student project, designed by three Miami Ad School students from the art direction and copywriting portfolio programs, chose Pandora, an Internet radio service, as the brand for inspiration. Underground Stations will be a section in Pandora where the best talent in the subways in New York will be recorded and use it to create stations near Internet radio service. As people are listening to their favorite stations and artist, the songs will come up according to each user’s taste. The album covers will function as non intrusive ads, when people like a song, they will check out who is playing, without leaving the app, users will be able to see more about the artist and the Underground Stations Project, like where and at what time the artist plays live, an Underground Stations finder will be create it with all the artist song’s, which the users can buy online or straight from Pandora, a microsite will stream live broadcast to the stations, where you can actually tune in into any metro station and hear the music 24/7. Underground Stations, the underground music of the city now available to the rest of the world. PANDORA UNDERGROUND STATIONS: A partnership with Pandora Online Radio to give subway performers the stage they deserve.